Its model number and name is #007 / Guile. 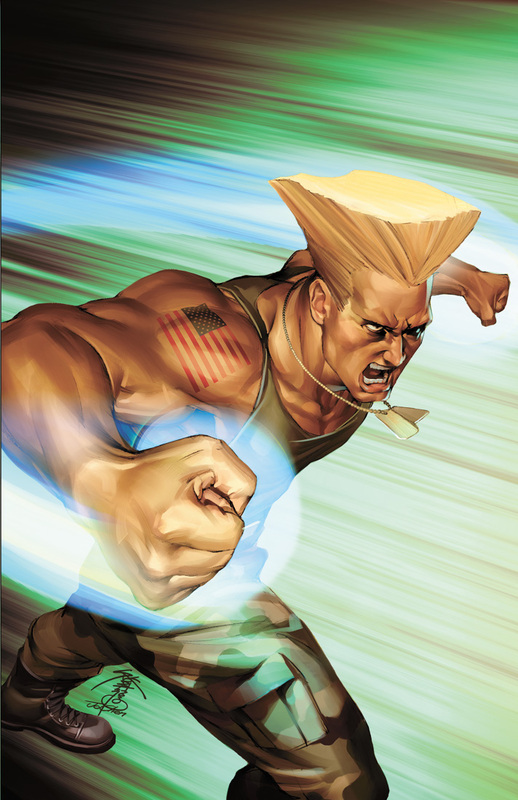 Character Bio - As a young, hotheaded soldier in the US Air Force, Guile served under the skilled martial artist Charlie Nash. Charlie taught him everything he knew, from Sonic Booms to Flash Kicks. Over the years, Guile's quick temper has turned to stoic resolve, but when a run-in with the maniacal dictator M. Bison ended with Charlie missing and presumed dead, he didn't hesitate to act. Entering the World Warrior tournament, nominally to battle Shadaloo and exact revenge, he still holds out hope of finding Charlie somewhere at the end of the line. Guile rolls an additional attack and defense die when adjacent to a Unique Soldier or Agent Hero due to his Soldier Loyalty special power. Current Unique Soldier Heroes and Agent Heroes. As a Human, Guile interacts differently with certain special powers. Current Special Powers that Interact Differently with Humans. As a figure with a Special Attack, Guile interacts differently with certain special powers. Current Special Powers that Interact Differently with Special Attacks. Last edited by Ronin; October 31st, 2017 at 09:53 PM. 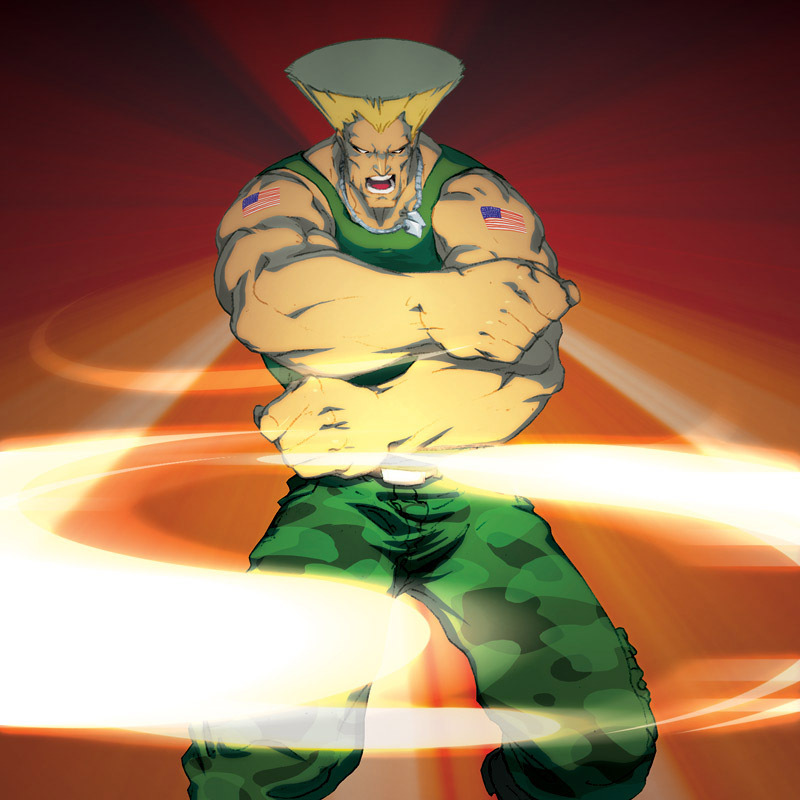 If Guile is adjacent to a Unique Soldier Hero or a Unique Agent Hero you control, add one die to his attack and defense. If Guile did not move this turn, roll 2 additional dice for this special attack. If Guile is attacked by an adjacent figure with a normal attack, after attack dice are rolled, instead of rolling defense dice, you may roll the 20-sided die. If you roll 12 or higher, Guile receives no wounds, remove 1 unrevealed Order Marker at random from the attacking figure's Army Card, and the attacking figure's turn immediately ends. Last edited by johnny139; July 4th, 2016 at 09:48 PM. 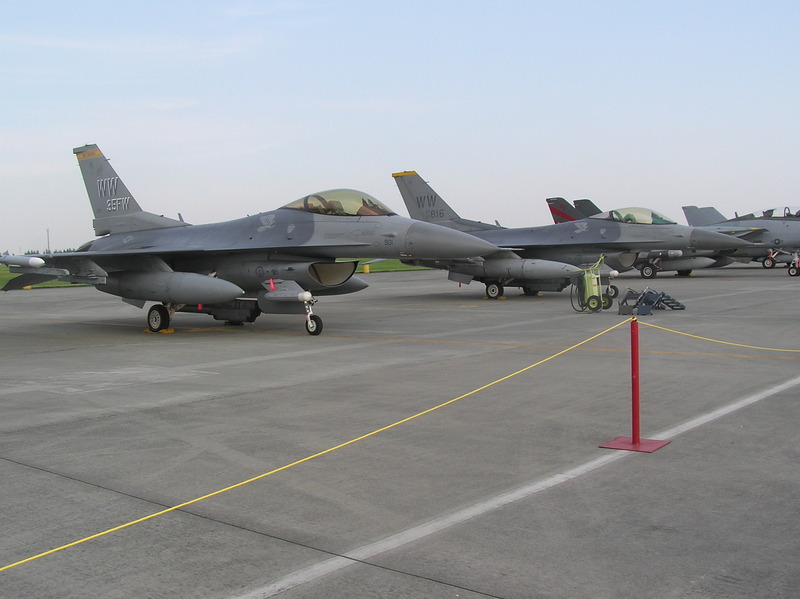 Seems weird to me that Soldier Loyalty makes him better when adjacent to Fighter. I assume that's because a lot of the other Street Fighters are Fighters, but the name feels off. Flash Kick is interesting. Very swingy and almost certainly not worth giving up your attack for, but a much more interesting defensive power than one of the many where there's no downside to rolling. Is 150 a goal like it is for the Ken and Ryu? I have a feeling he may come in slightly higher than that. ...misprint of the first power. I copied and pasted from Jewel. It should be when he's adjacent to a Unique Soldier Hero. 150 is a ballpark, not a goal. I don't mind him finishing up anywhere from 130 to 160, and don't mind tweaking stats down a bit if necessary. That makes more sense. He'll certainly like having Cap as a buddy. Probably his best combo if you can keep them together. Definitely. Those two and Bucky should make a decent core for an army. With that change, the first two powers look good. The wording on Flash Kick is a bit of a mess. Instead of rolling attack or defense dice against an opponent's adjacent figure, you may choose to roll for Flash Kick. If you roll a 14 or higher, you may remove 1 Order Marker from the opponent's figure, ignore that attack, and end that figure's turn, if possible. What are you rolling? Presumably the 20-sided die, but the power should say so. Can the removed Order Marker be revealed or unrevealed? I'm assuming unrevealed, but it should be specified. The syntax of that last sentence is a bit icky right now. Ignore what attack? Nowhere in the power does it specify an attack (just dice being rolled) so the "that" doesn't have a clear antecedent. Instead of rolling attack or defense dice for Guile against an opponent's adjacent figure, you may roll the 20-sided die. If you roll 14 or higher, remove 1 unrevealed Order Marker from that opponent's figure, if possible and, if the opponent's figure rolled for an attack against Guile, the opposing player's turn immediately ends and Guile receives no wounds. I wouldn't mind seeing it restricted to normal attacks, though, as the mechanics could get a bit messy on turn ending for a special attack with multiple targets. He'll definitely be a great choice for a Soldier-vengers build if you put those pieces together. Limiting it to normal attacks sounds like a good idea. That wording on Flash Kick looks a lot better - though I would probably only have it end the figure's turn, if only thematically. You can tell how old the write-ups is, though; I work shopped it pretty heavily with Scapemage in his Hero days. Speaking of which, I figure I'll give @Scapemage a shout to see if he has any input, since this is at least 50% his design. I was going to bring up the Soldier Loyalty thing and the wording on Flash Kick, but both of those have already been addressed. Flash Kick will make him a little tricky to balance, but I like the design. No concerns that Bats didn't already address. Nah...too complicated. We're trying to keep the Street Fighters as straightforward as possible. Besides, when we design Sonic the Hedgehog, Symbiotes would always be rolling fewer defense dice against him.